“Fighting like cats and dogs” You may have heard the expression, but the truth is that many cats and dogs live together quite amicably in the same home. According to a study in Israel, about two-thirds of cats and dogs do get along when they share the same home. About one-fourth of cats and dogs who live in the same home were indifferent to each other. And the remaining 10 percent of cats and dogs did not get along well at all. According to the researchers who performed the study, they theorized that cats and dogs may not get along sometimes because the two species have different body language. But, the researchers noted, cats and dogs seemed to be able to overcome the differences and learn to understand each other. 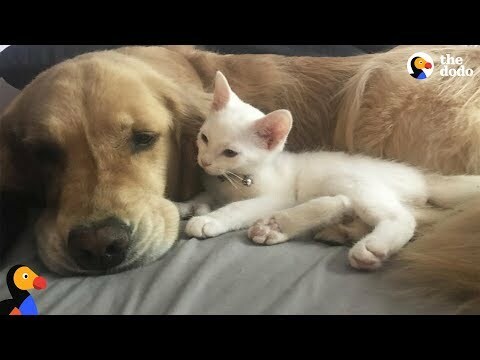 This amazing video really proves that cat and dog can actually get along. Doglopedix“Fighting like cats and dogs” You may have heard the expression, but the truth is that many cats and dogs live together quite amicably in the same home. According to a study in Israel, about two-thirds of cats and dogs do get along when they share the same home. About one-fourth of cats and dogs who live in the same home were indifferent to each other. And the remaining 10 percent of cats and dogs did not get along well at all.